Dr. Mark Sundberg’s Verbal Behavior Milestones Assessment and Placement Program (VB-MAPP) is an assessment with a curriculum guide and skill-tracking system that assists educators, speech pathologists, psychologists, and parents in creating individualized intervention programs for children with autism or language-based learning disabilities. The first component is the VB-MAPP Milestones Assessment, which contains 170 measurable earning and language milestones across three different developmental levels. Skills assessed in this component include mand (i.e. request or command), tact, echoic, intraverbal, listener, motor imitation, independent play, social play, visual perceptual and matching-to-sample, linguistic structure, group and classroom skills, and early academics. The second component is the VB-MAPP Barriers Assessment, which helps a clinician identify and assess 24 common learning and language difficulties that children with autism or other developmental disabilities face, such as behavior problems, instructional control, defective mands, tacts, echoic, imitation, visual perception, listening skills, intraverbal and social skills, and failure to generalize, among many others. 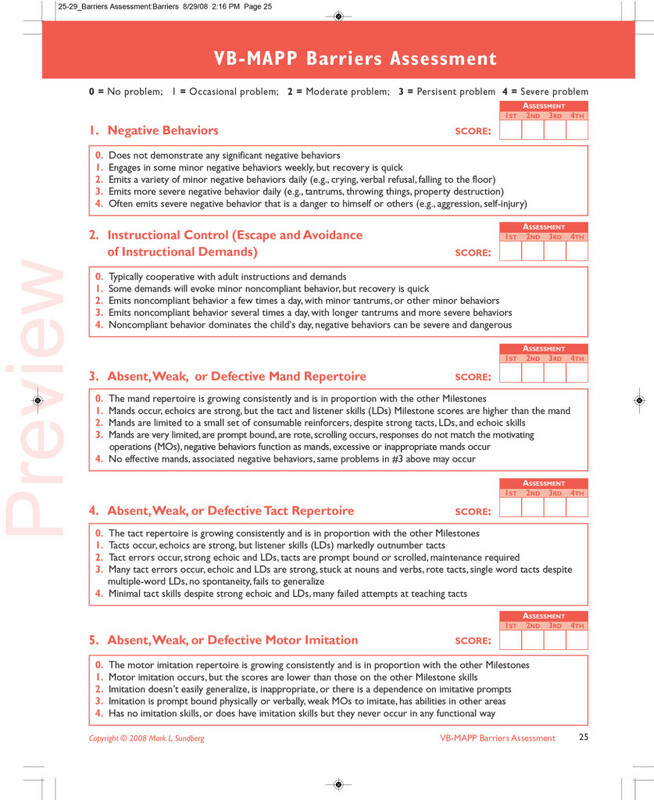 The third component is the VB-MAPP Transition Assessment, which has 18 assessment areas to help measure a child’s progress and readiness to be in a less restrictive educational environment, including the Milestones Assessment from the first component, the Barriers Assessment from the second component, negative behaviors, classroom routines and group skills, social skills, academic independence, generalization, variation of reinforcers, and rate of skill acquisition, among other areas. which offers a breakdown of the skills that cover the 16 areas of the VB-MAPP, as well as a learning and language skills curriculum guide. These skills provide parents and educators with activities that can facilitate generalization, maintenance, spontaneity, retention, expansion, and the functional use of skills in educational and social contexts. The last component is the VB-MAPP Placement and IEP Goals, which correspond to each of the four assessments above. 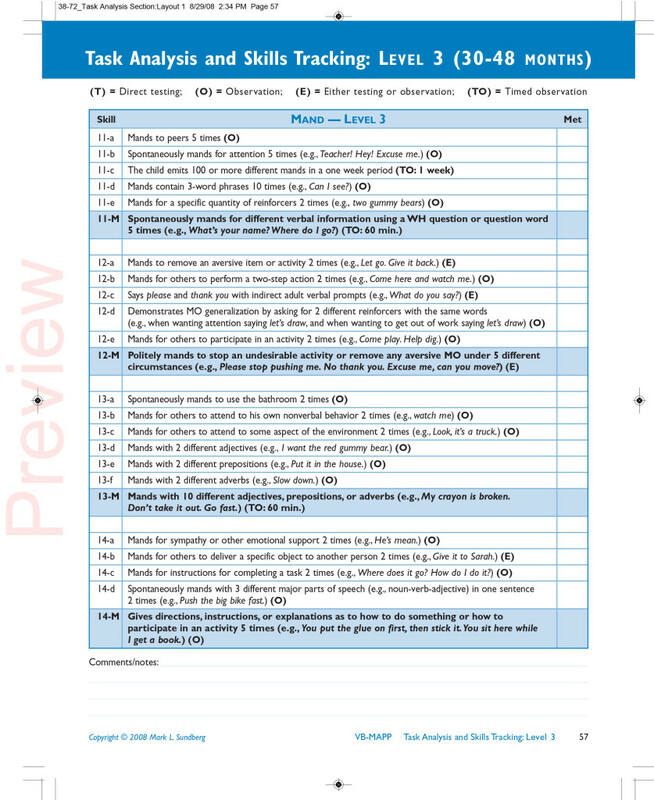 This section provides a specific direction for the 170 milestones assessed in the first component, as well as suggestions for IEP goals, for the intervention designer to balance out a specific program with all relevant and necessary parts evaluated. 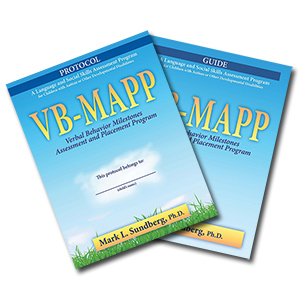 The VB-MAPP offers a new generation of the application of B. F. Skinner’s analysis of verbal behavior to language assessment for children with autism or other developmental disabilities. *Offer expires on May 21, 2013 at 11:59 pm EST. Not compatible with any other offer. Be sure there are no spaces after the Promo Code when you enter it at checkout. The offer is valid on the VB-MAPP Set (DRB 680), the single VB-MAPP Protocol (DRB 681), and the VB-MAPP Guide (DRB 685). Offer does not apply to already discounted 10- and 25-packs of Protocols. Written by: Different Roads to Learning on May 14, 2013. This entry was posted in ABA, autistic spectrum disorder, Difflearn Promo Code, Pick of the Week, Sale and tagged ABA, Applied Behavior Analysis, Autism Assessment, autism education, autistic spectrum disorder, language development, Mark Sundberg, PhD, VB-MAPP by Different Roads to Learning. Bookmark the permalink.